Youthful skin is composed of more than 75% of collagen ensuring elasticity and skin tone. As we grow older, collagen density in the skin is reduced causing a loss of structure and elasticity, and the appearance of wrinkles. 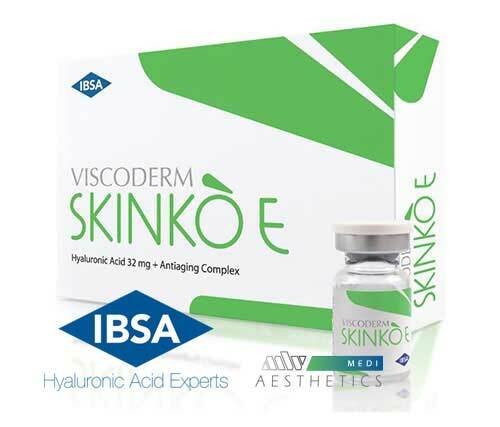 Even hyaluronic acid (HA), the molecular scaffolding of connective tissues, is reduced during the process of skin ageing. A complete anti-ageing product which combines a non-chemically modified, natural hyaluronic acid and nutritional elements. It prevents and treats the reduction of HA and stimulates the production of collagen. Our hyaluronic acid products contain an ultra-pure grade HA, produced through a patented process, ranking worldwide as “TOP HIGH QUALITY” in terms of purity and safety! Mesotherapy involves multiple injections of specially prepared cocktails of medical grade pharmaceuticals including Hyaluronic Acid (HA), vitamins, minerals and amino acids right beneath the surface of the skin into the problematic area/s. Using a very fine needle, a “drop” of the solution is used at each injection area to nourish and rejuvenate, promote production of collagen and elastin and stimulate your skin’s metabolism. Compared to other skin treatments, the Injectable Mesotherapy is pain and risk free. Furthermore, unlike Botox treatments, it will not have negative effects on your muscles or nerve system. For prevention of early signs of skin ageing and maintenance of active cell nutrition in the dermis. The Skinko E anti-ageing complex contains more than 50 active elements including hyaluronic acid, minerals, essential amino acids and vitamins. It acts on both, the causes and the effects of skin ageing, preserving the skin’s biological qualities and enhancing the natural beauty. The outcome is a younger looking, healthier skin with improved skin tone, enhanced radiance and freshness. An all-in-one treatment for a full face skin rejuvenation, for prevention of early signs of skin ageing and skin renewal, through intradermal injections to all areas of the face including forehead, around the eyes and lower face/lip area. 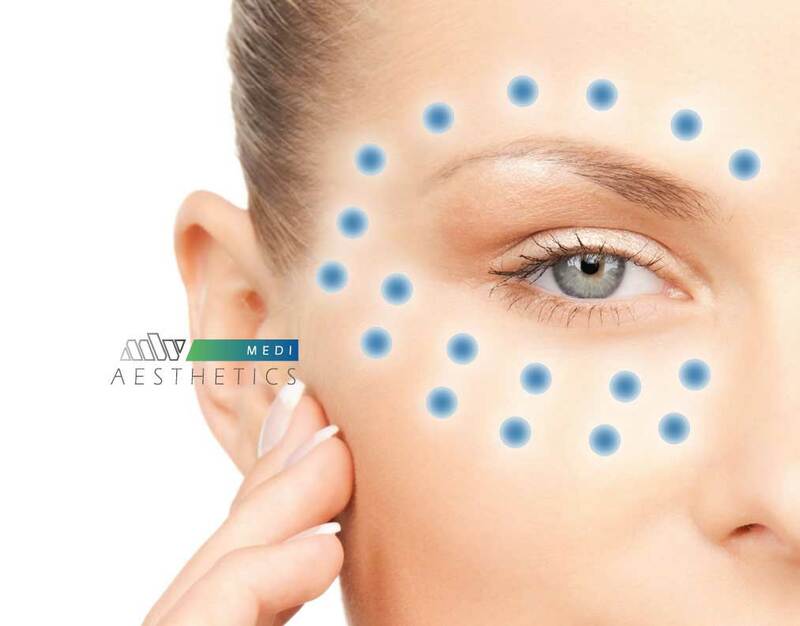 Mesotherapy for eye rejuvenation is designed to rejuvenate the appearance of the eye. It improves the skin brightness and hydration, softens wrinkles and expression lines. The perioral area comprises the lower one-third of the face, which consists of the upper and lower lips, the nasolabial folds, and the chin. This area must be addressed in facial rejuvenation to achieve a complete and more youthful appearance. Smokers’ Lines, unlike other facial wrinkles, present a bit of difficulty. 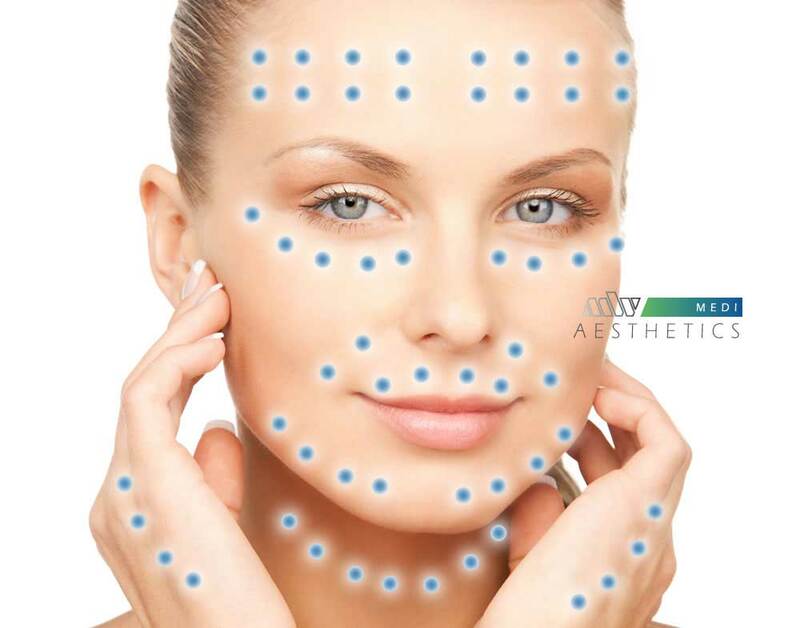 Mesotherapy penetrates the upper level of the dermal layer offering real results. A poorly-defined or sagging neck can add years to a patients overall facial appearance. Expertly performed Injectable Mesotherpy can restore a natural and youthful neck profile, with no downtime. A multiple injections of medical grade cocktail rejuvenate the skin promoting the production of collagen and elastin. The skin feels tighter and fresher. As the years pass, skin on the hands thins, veins become more prominent and liver spots appear. The Injectable Mesotherapy for hand rejuvenation is becoming increasingly popular, smoothing the skin, encouraging the production of collagen to provide a youthful look. The mesotherapy treatment targets the signs of ageing, making the hands appear fuller and healthier.